Mark & Niki's Snack Hut located on the Platzl in Kimberley is home to a wide variety of hard ice cream and summer time treats. They also have hot dogs and cold drinks. Their specialty is a home-made waffle cone. Standing at the front counter you can watch Niki Traverse make the delicious cones from scratch. She uses an older machine to cook the batter, then rolls the waffle to give it the cone shape. Then she adds a small marshmellow and piece of chocolate to the bottom of the cone! Mmmmm, delicious. 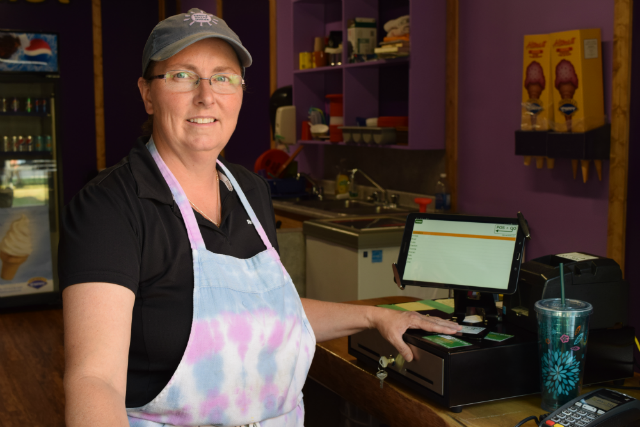 Snack Hut chose POS-n-go for its point of sales system. The fast order screen allows Niki to complete an ice cream sale in no time at all. Niki invites all residents and tourists to stop by and try out their favorite ice cream and a homemade waffle cone. POS-n-go point of sale is ideal for fast food, restaurants, pubs, night clubs, retail shops, salons and personal services businesses. It's loaded with features at one ultra-low monthly fee.